What do you think the most important quality is in a man? (Although Elijah Ministries is primarily directed toward men, obviously this message could apply to women as well. I’ll let you make the gender adjustments :-). When I consider how to answer that question, I think of the life of Jesus. His life defines what is good, and in Him we see what God considers the most important quality in a man: love. The more we know God, the more we see that He is love. This begs the question of us men: Have we seen that the way we love God, our wives, our children, and others is the most important quality about our lives? Imagine a large group of men, numbering between 600 and 2,000 according to some projections, gathered at the base of a mountain called Mt. Horeb. God told Moses to assemble the men and their sons and grandsons so that He could give them a blueprint for how they were to live their lives as they journeyed to and later settled in the Promised Land. We might call the words of Moses “God’s marching orders,” where He told them the most important things they needed to know. Here’s the bottom line: Love God with all your heart and teach your children to love God with all their hearts. Here’s how Moses said it. 5You shall love the Lord your God with all your heart and with all your soul and with all your might. 6These words, which I am commanding you today, shall be on your heart. 7 You shall teach them diligently to your sons and shall talk of them when you sit in your house and when you walk by the way and when you lie down and when you rise up (Deut. 6:5-7). The rest of the Old Testament history of the nation of Israel reveals that only a few men understood that love for God was the most important quality of a man. Instead, they got caught up with what the world thinks are the most important: wealth, power, and significance. To get those things, men forsook God and pursued the gods of their neighbors. Not much has changed since then. When Jesus came, he was God with us, Immanuel. What was the most important quality of Jesus Christ? I direct your attention to John’s first letter where he writes, and God says, “Beloved, let us love one another, for love is from God; and everyone who loves is born of God and knows God. The one who does not love does not know God, for God is love” (1 John 4:7-8). John wrote that Jesus is the manifestation of the love of God (verse 9). 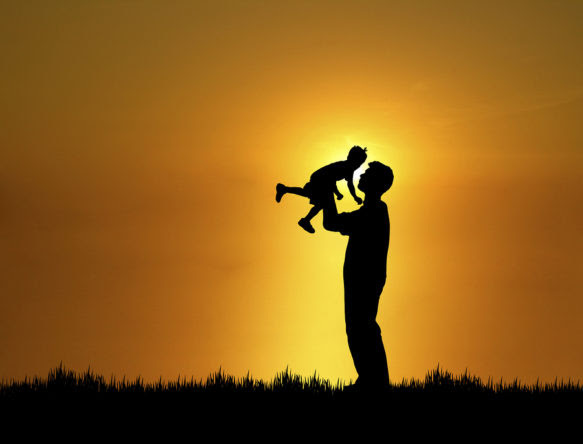 Jesus made the Father’s love plainly and clearly evident. So we can conclude that John said, “God is love,” because he knew Jesus Christ; and love was and is the most important quality of His life. Can we not conclude also that love is the most important quality of a man, if it was the most important quality of Jesus Christ? Apparently, identifying men who are believers in Jesus Christ should be as easy as identifying a McDonald’s hamburger restaurant. There’s a sign out front! Just as the Golden Arches indicate where you can get those delicious fried apple pies, love indicates a man in whom one can get a taste of Jesus. It’s the fruit that’s inside that makes him so appealing—the fruit of love. Every man who is born of God loves because God has given him the Spirit, and the fruit of the Spirit is love. The people around him should be saying, “I’m lovin’ it!" No one has seen God at any time; if we love one another, God abides in us, and His love is perfected in us. By this we know that we abide in Him and He in us, because He has given us of His Spirit (1 John 4:12-13). But the fruit of the Spirit is love, … (Gal. 5:22). When the Apostle Paul wrote to the Corinthians about the pursuit of God’s gifts, he made sure there was no confusion about what the greatest gift, and the most important quality, was that a man should seek. These words are famous. Of all the gifts from God, love is the greatest gift and the one to be most sought after.As Paul encouraged the Ephesians to be filled with the Spirit, he told the men to love their wives as Christ loved the church. Not only is love the most important quality from God’s perspective for a man to have, but it also is the most important quality from a wife’s perspective. Father, thank you for another day of life to live to know You and to love with Jesus. I ask You for the presence and power of Jesus to trust You so I can love those you put in my path today. Fill me with the Holy Spirit for Your glory. I call this a seed prayer, because these words express an attitude of faith in God and His purpose in Christ that is packed with fruitful potential. When planted and watered, the seed will grow and produce the life of Christ in us. Will you make this your prayer today and every day? The most important quality of your life is God’s kind of love flowing through you. Knowing and loving God with all your heart and loving others with the love that you have experienced through Jesus Christ should be your greatest pursuit in life. Let’s do this! P.S. If you haven’t read my book, Equipped to Love: Building Idolatry-free Relationships, I recommend it to you so you can grow in God’s kind of love. You can find it in printed or e-book format here.